It’s more than likely the handiwork of some scurrilous Scouse scallywags but, if it does prove to be kosher, then may the good lord Xenu descend and push safety pins through my eyes before the start of next season. Someone’s taking the wee-wee aren’t they? Please tell us someone’s taking the wee-wee! 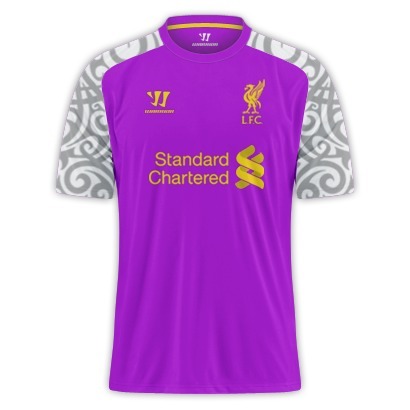 The sleeves r designed to match the arms of some heavily tattooed liverpool players? @Bozza: Ha! Great shout. Designed with Skrtel in mind. Ye gods, that’s hideous! Let us hope it is someone taking the wee-wee, like that supposed yellow kit from last season! Open it in photoshop and invert colors..
Looks like something made in Thailand. Looks like something designed and made in Thailand by blind folks. They could have got the Liver bird wrong, at least. Maybe put some flames on it. Looks like a Thai Airways air hostess outfit !!! it’s bouffin ! It’s like the inspiration for the sleeves are Raul Meireles’ arms. Ah the aptly named Warrior kit, as Liverpool attempt to “battle” their way out of mid-table mediocrity for the duration of 2013. Classic, the scousers would suit this ridiculous design, and tribal tattoos for that matter. It’s fake for one simple reason. They’re not going to return to the Liverbird crest because it can’t be trademarked, just the same as Arsenal won’t go back to the simple cannon. I think it is a fake due to the fact the crests are missing the torches which represent the Hillsborough disaster I simply don’t see Liverpool removing those now. Well, the current design is in homage of the 96, but it does serve a corporate purpose as well. Just the same as any other club which has changed their badge (usually for the worse, like Arsenal). The club simply doesn’t own the rights to the logo itself, it can’t be trademarked or copyrighted and because of that, anyone can technically create replicas. You’ll never walk alone…Unless you’re wearing this around your friends. I’m a Chelsea fan, but I don’t think it’s that bad lol. Still i’m glad it aint ours. Typical football fans hating any kit that’s not monotonous! GET A GRIP! What do you actually want as your away kits? BORING white kits? At least this has some imagination about it, obviously It’s flamboyant but at least It’s not forgettable, which most Liverpool kits are. looks like a hawaiin took a dump on our kit. hah! Its Horrible but still better than Utds 1st and 2nd kits. This is DEFINITELY NOT the new 3rd kit. It may well be a new training shirt, but the online mock-up of a Purple/Black/White shirt IS the real deal!! Happy days!! !